The mental snap shot shouted "Europe" as soon as we deplaned in Frankfurt from Portland, with the familiar backdrop of people-scale stone buildings and the dull grime and wear patina on the cobbled streets. And just as typical was the foreground filled with too many people dragging on their cigarettes like it was an Olympic event and the multitudes enveloping ice cream cones as though it were a new love. Being in Italy filled in more detail the next day (after our evening flight to Rome) with the spotting of the very Mediterranean habit of people of all ages sprinkling litter behind them like it was a birth right as they sat, walked, and drove. Packs of parked and moving motorbikes also reminded us of the typical Italian scene. 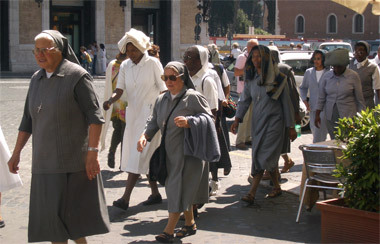 Several nuns were carrying their sweaters on their heads. And as we settled in, it could only be Rome as the high concentration of men and women of the cloth appeared to be from all corners of the globe. On the first morning's bus ride into the old part of Rome I guessed that the nun in all white closest to me was from South or Central America because of her rough wool shoulder bag with a lama motif. The short Asiatic woman near the front of the bus in a habit of grays and blacks had me guessing she was from SE Asia or India from the higher appearing gold content of her ring. And perhaps the couple of nuns on the sidewalk carrying neatly folded sweaters like cargo on their heads were from Africa. I couldn't even guess a homeland for the darker skinned nun who wore a fisherman's cap atop her completely encasing, traditional veil-like religious headwear. These familiar sights and sounds of Europe resonated with those we'd accrued over the last 6 years of travel, making our 12 hour stay in Frankfurt that preceded our 10 day jet lag recovery junket to Rome feel cozy. Though unlike Bill I can't speak German, the spoken and written words surrounding me in Frankfurt were ordinary enough not to be jarring. And as we waited to board the budget flight to Rome the same evening that we arrived, the shift towards Italian from German in the background chatter was pleasant too. The din of Western European foreign languages now triggers more of a relaxation response in my body rather than setting off alarm bells in my head as it once did. Once again, it was satisfying to feel at home in a bigger world than we lived in during our first trip abroad together 2 decades ago. The irksome side of actually taking our Roman holiday was that the prices kept going up at every turn. For the last 2 years we'd made at least the first 10 days of our return to Europe a non-biking holiday, in part to allow us to recover from jet lag before navigating in traffic. But the holiday also proved to be a welcome interlude between the intensity of our calendar-oriented activities while at home and our typically "constantly on the move" routine once on the bikes. The original plan for this late spring return had been to stash the bikes and most of our luggage in Frankfurt and take a fast train on to Copenhagen. Our bikes are liabilities rather than assets in big cities, so seeing the northern city without them seemed clever. But alas, our time consuming debacle with the US government in getting more visa pages added to our passports squeezed us out of the always expensive Copenhagen lodging market. 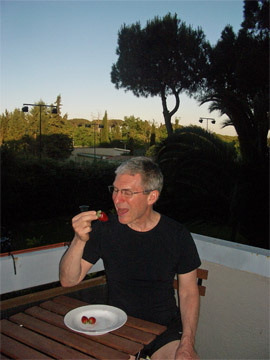 Finishing off more strawberries on our balcony. The flights in and out of Frankfurt and on to Rome went smoothly and as planned, but the intermediate step of storing the bikes and suitcases that was expected to be over $100 jumped up to over $200 because of a technicality. Then we ended up staying 1 night each at 2 different hotels before settling into a furnished vacation apartment in Rome, and the prices were always more than we expected. We'd prided ourselves in keeping our lodging prices below a $100 a night all but a few times in the last 6 years, even in very expensive Iceland and England and with the weakening dollar, but that price barrier melted away in Rome. But despite the mounting expense of our trip to Rome, we shifted our attention to the experience at hand once we were in the apartment. We weren't in Rome long and were already pleased with it as a choice for jet lag recovery. The warm, sunny days were nurturing in themselves and were supportive of our half-speed brains. We've settled on big cities for this difficult interval, despite their inherent chaos, because of the readily available of stimulation. The urban intensity keeps our dozy brain cells activated in the daylight hours, whether we initiate much in the way of activities or not. Every day in Rome began and ended with an almost hour long series of bus and metro rides between our apartment and the city center. It was a bit of a nuisance being so far out, but our apartment in the 'burbs near the Vatican did give us welcome relief from the air and noise pollution of the center which were displaced by the higher density of green lawns and trees. There really was a ram's head on a battering ram. After arriving in the old town area, we'd look for a shop from which to buy fresh bread and another bottle of inexpensive mineral water to supplement our lunch. The end of every other day included a big grocery shopping stop for our home-cooked meals. Even though our apartment was more than we hoped to pay, our daily expenses after that for food, entertainment and transportation for the 2 of us was under $20. We were lucky too in that we were in Rome during a special culture week so that the museums we'd happened to pick were all free. Several hours many days were filled with visiting these less famous, history-oriented museums and walking the streets of Rome's old town, which is a history lesson in itself. When the museum displays became uninteresting or we needed a change of pace, we'd shift our attention from the content of the exhibits to working on our Italian vocabulary. Rather than being hard-working tourists, we looked at previously visited sights like the Coliseum and the Forum from afar. 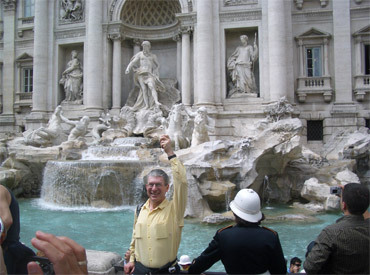 Both walking and our daily bus journeys gave us ample opportunities to admire many of Rome's grand facades and piazzas. We did duck into the Roman Pantheon for another look at the amazing concrete dome the Romans built and Bill was a proxy for his sister when tossing her penny into Trevi Fountain. And as always when we travel with or without the bikes, finding a scenic setting for our outdoor lunch was a high priority. The obligatory tourist ritual at Trevi Fountain. Our slower functioning, hazy brains made it easy to linger after our picnic lunch on the Spanish Steps one day as we watched the hustlers working the young male tourists. We weren't close enough to hear the exchange but the body language read something like "Welcome to Rome my friend, let me give you a gift, something to remember the Spanish Steps by." I imagined that there was some little enticing story told as the hustler got the young man to hold some strands between his fingers while the local quickly braided a thin bracelet, tied it onto the guy's wrist, and severed the ends with nail clippers. Then the press for compensation came. The young men often protested, but usually forked over 3 € or more. It was amazing to watch the hustler's look for their pigeon, sometimes waiting as long as 10 minutes for just the right one. Once the prey was selected, the all-smiles new friend would practically dive-bomb, slowing just in time to gently tap the tourist's shoulder. Women were rarely approached and never as the primary target. Usually women companions rolled their eyes in disgust at the gullibility of the pigeon. Some tourists also must have felt under siege. We wondered if one hustler had a more elaborate scheme as with one young man he had his fingers in the pigeon's open wallet and 10 or 20 € bills were flashing around like some shell game. We couldn't tell if he was shortchanging the guy with with quick switches, passing counterfeit bills, or doing recon work. We pondered if the bracelet was just a ploy to determine where the pigeon kept his wallet and how much it contained as a quick cell phone call was made after he released his first prey. We saw no such call being made by a group of hustlers that seemed to whisk off the first scam-man from our section of steps, so we left without knowing if the drama went beyond pocket-change for the bracelet. 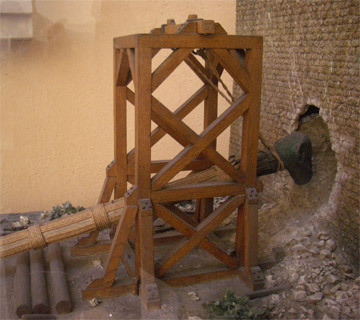 Another people-sighting in Rome that left us wondering was that of 7 different short-limbed dwarfs in 3 days--perhaps as many as I've noticed in a life time. Each little person we saw was "solo," each in a different part of Rome, and they spanned the decades from young children to middle-aged adults. Our curious minds could come up with no credible explanation as to why there was such a concentration in 1 city, especially since they looked like locals window shopping, going to work, and strolling in a park rather than out-of-towners here for an event. The main purpose of the phones is for emergency backup when hiking in the mountains, but not being cell phone owners in the US meant we had a lot learning to do. Buying chips now would allow us to be experienced with the European operation of the phones before we hit the Italian hiking region in a month or 2. The in's and out's of an individual phone are challenging enough without the additional complications of making our way around the language barriers and differences in conventions between European countries. The industry has changed a lot in the 6 years since we were told then we couldn't buy a phone in Europe without a domestic street address, but we still will be looking at a different phone number in each country we use the phones in to keep the prices down. Having been in New Zealand recently had me at least partially looking at Rome through the eyes of a tourist from New Zealand. For us, the most immediate contrast was the spring weather. We arrived in middle-latitude New Zealand in the equivalent of early May and endured many chilling days, downpours, and hurricane force winds. In contrast, the temperatures for our 10 mid-May days in Rome ranged from almost needing a sweater while we picnicked to the heat of the low 80's. The winds picked up enough a couple of afternoons for me to hang on to my hat but they weren't strong enough to seek out shelter when sitting--what a difference. Accommodations in Rome however had us immediately longing for New Zealand and no doubt left the Kiwi tourists wondering what they were doing wrong. The prices were all over the map in New Zealand, but the quality with few exceptions was quite high. The Kiwi motel culture places the burden of putting the kitchen back in order on the guests and all seemed well trained to do so thoughtfully. Rooms were generally quite clean and in good repair. Not so in Rome. We immediately noticed the substandard (or lack?) of vacuuming in the rooms, the worn-out mattresses, and never-quite-right accessories in our 3 different Roman abodes. And darn it anyway, when one is in central or southern Italy, the standards slip, and even at the $150/night lodging we were making repairs to make the space acceptable. For that price one shouldn't be fiddling with the shower drain to get it flowing or standing on chairs to bang away at outdoor roller shades or using extra blankets to fill in the hollow of a worn out mattress. But Bill had spent hours in the States and we'd devoted 6 hours of our first day in Rome to getting the lodging we had, so we made the needed modifications By comparison, the tweaking we did to our New Zealand rooms were always on a much smaller scale. But on our second full day in Rome we bought our first of many boxes of strawberries for under US$2 per pound and were buying other produce for a fraction of what we paid in New Zealand. It was a joy to be tourists and have access to a good variety of food at good prices, a combination we never knew in New Zealand. 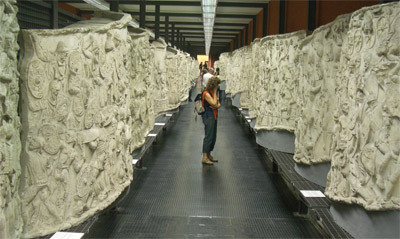 A close-up look at old copies of Emperor Trajan's memorial column. Also coming from a young country like the US, Kiwi tourists must be absolutely blown away like we are at the clutter of ancient history around Rome. Like in Oregon, something 50 or 100 years old is historical in New Zealand. In Rome one sees evidence of a lifestyle that was more refined 2700 years ago than in our young territories a hundred years back. New Zealander's accustomed to constantly wind-freshened clean air and little noise pollution must be overwhelmed by the insults to their minds and bodies when in Rome. And they must feel left high and dry when they walk into a closet-sized Roman tourist info office where the staff person is prepared to do little more than hand out a free map of the old town and answer "Yes/No" questions. In contrast, the tourist officials in New Zealand are happy to plan your entire stay in their country, down to making any or all of your lodging, transportation, and event reservations for the cost of the more distance phone calls. And the laid-back, trusting Kiwi's must be easy marks for the legendary Roman pickpockets and scammers, several of which we learned about second hand. Out in city traffic, the Kiwi's must be rethinking childhood stories of the power of St Christopher to protect pedestrians, as when a pedestrian steps out into a sea of autos, the waters part around the Roman walker. In New Zealand, the auto's have the right away and they exercise it to the hilt. The relationship between drivers and pedestrians in Italy requires some boldness but nonetheless is a congenial negotiation whereas in New Zealand the drivers expect and receive submission to their greater legal rights. And just as I imagined the Kiwi's reeling from contrasts between their world and life in Rome, we had our chuckles and gasps too from the contrasts with our traditions. We, like many, have been seduced by the promises of the Mediterranean Diet that among other things includes an abundance of fruits, vegetables, and olive oil. We even have a half quart bottle on my bike that is reserved for our olive oil for cooking. Given that backdrop, I was stunned to see a prominent white tin in a Roman grocery store labeled in Italian "Hearts." Among a sea of olive oil containers, this bottle of corn oil pronounced that it was scientifically proven to reduce cholesterol. We also scratched our heads as we struggled to understand what the old Mediterranean Diet offered for breakfast. The modern one in the hotels is usually limited to white bread, jam, cookies, and strong coffee--hardly our idea of a breakfast of champions. The breakfast aisle in the grocery stores is stuffed with other similar white flour and sugar products and the healthiest of the few breakfast cereals contained about the same amount of sugar as our lunchtime dark chocolate bar. We've learned over the years to not make too many assumptions about what is or isn't a prescription drug in Europe, as we've bought things like epinephrine and the potent antibiotic Cipro over the counter when abroad. This trip I was curious about the price and availability of an anti-reflux medication I had just started taking. The one pharmacist explained that indeed the product was a prescription item in Italy but if I was already taking it, she would sell it to me. When asked if I needed to show her the tablet or some paperwork, the answer was "No." The price was in the range of US prices for similar products. This gray area that doesn't exist in the US with prescription drugs came up last year when in Corsica, a French island. I was turned down by 3 or 4 pharmacists when I wanted to buy an antifungal medication but another happily sold me as much as I wanted of the expensive, prescription drug. The post-9/11 hypersensitivity to security that has become a necessary evil in the US isn't as oppressive in Rome. The serrated kitchen knife borrowed from our apartment that was in my backpack raised no eyebrows when it went through the scanner at one museum entrance. At another, I was sure it was our seemingly abandoned heap of backpacks and water bottle that caused a museum guard to come running, but no, it was the inappropriate touching of an exhibit that caused the scurry. Our backpacks that were right next to where the offending incident occurred were completely ignored. 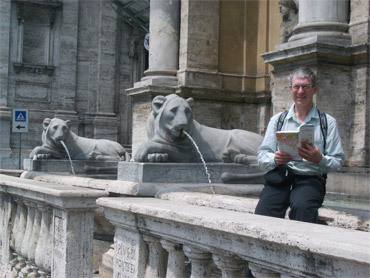 Learning the secrets of the Egyptian lions at Piazza San Bernardo. After string of days focused on museums, our last leisurely day in Rome was spent taking a self-guided walking tour for children, one that was written in Italian. The day before we had purchased a children's book on the animals of Rome in hopes of nudging us to keep reading some Italian while in German speaking countries. Half of the book was focused on live animals out and about in the city. I thought the second half of the book was on zoo animals, which was less intriguing. But fortunately Bill took a more careful look at the book's format and discovered that the zoo animals were really stone animals--the zoo carved in the many city monuments. The clever angle was too tempting to resist so we set out the next morning to do the tour on the fly. The level of difficulty of the book was a better match for us than we realized when we purchased it as we could guess at about 2/3's of the story at each monument with quick read. Looking up even a half dozen words in our electronic dictionaries filled in a lot of the missing ideas. Though it was hard work, we were delighted with the dual rewards of deciphering much of the text and learning the stories about the monuments that were intended to pique the interest of children. It was too bad we hadn't had the book at the start of our stay in Rome, but even using it 1 day should hook us in to reading more of it in the coming weeks. Heading out of Rome & back to Frankfurt with our carry-on. As the jet lag fog began to clear and sleep was less of a struggle, Bill began itching to get back on the bikes. His nagging back discomfort of the last 6 months seemed resolved and he was anxious to road test it. Usually I am the restless one, the one wanting to move on, but not this time. No need to end this leisurely interval in Rome welled up in me and I enjoyed having our days effortlessly filled with its complex images. Practical matters like the time being up on the prepaid apartment and return airfare kept me from having to seriously consider just how long I'd be happy coasting in Rome. After 10 nights in Rome, we would rewind the movie and take the bus out to the secondary airport in Rome; hop on another, even later evening flight, and then check-in to a suburban airport hotel near Koblenz. The next morning we'd make the 90 minute bus journey back to Frankfurt's international airport and pay the handsome ransom on our bikes and checked luggage. 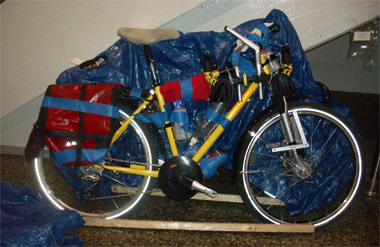 Beginning to unpack the bikes at Frankfurt. 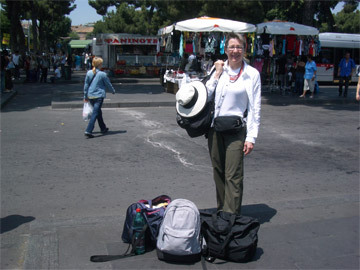 The plan was to transfer all the gear from our stashed checked luggage and the carry-on luggage that went on to Rome with us into our panniers and ride out from the airport. It was designed as a short riding day, especially since a complete damage assessment hadn't been done on the bikes since they flew nearly naked from Portland. We knew 1 water bottle cage would need to be reshaped and hoped that was the extent of the mishaps. We are in the city of Trier in southwestern Germany, a day or 2's ride from France. 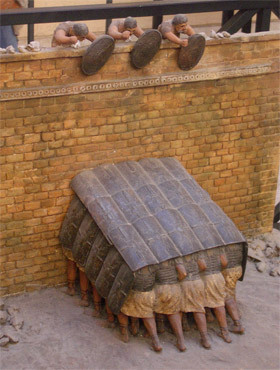 We visited Trier in 2001 and were looking forward to revisiting the 3 Roman museums which are unfortunately all closed. We'll swing by Trier again in the next week or 2 after they've reopened for a special exhibit. In the meantime, we'll continue our generally southwest journey from Frankfurt towards Metz, France for a short visit to that as of yet unvisited area. We are doing well and enjoying being on our bikes and on the road again. The rainy days made us wonder why we were doing this and the warm, sunny days that had us cruising the rivers lined with vineyard carpeted hills reminded us that this indeed is the good life. The "disposable" luggage we abandoned in May. Are you in the Portland/Vancouver area with some luggage you plan to discard but that still has a little life left in it? If so, we'd happily take it off your hands this December. As we were leaving Portland a friend mentioned that he had a suitcase or 2 lined up for donating to a charity and I commented that we were always in the market for disposable luggage. This May in Frankfurt was typical, where we abandoned 3 pieces of luggage at the airport. It's a painful process to just ditch usable goods, but we can't carry them with us for months and the cost of storage is prohibitive. Our compromise is to buy the cheapest luggage we can find that we think will survive the journey. This time it was a fine soft-sided suitcase we found at a Portland thrift shop for $5; a now-disintegrating, $15 duffle bag we purchased in Frankfurt last October and managed to take to and from New Zealand and back to Frankfurt by making repairs both on the road and again at home; and a carry-on bag that made the same journey as the duffle, though with a defunct zipper on its last trip back to Frankfurt and Rome. 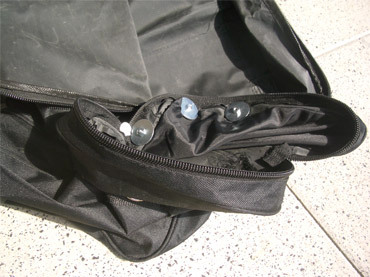 A field repair of a disintegrating duffle using washers, nuts & bolts. This winter we'll be looking for more luggage to make the one way trip back to Europe in the early spring and then be ditched. 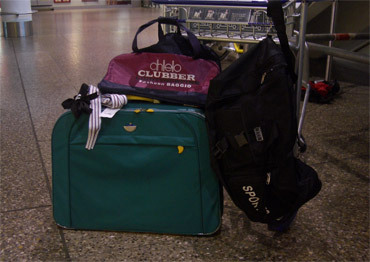 We usually need a combination of lightweight, large bags to check-in and smaller bags that just make the carry-on limits. Wheels and good handles are huge assets and intact zippers a must. Let us know if you have suitcases we could squeeze 1 more journey out of before they are retired. Thanks.